Once again, it is time for the Retro Challenge! This time around... well, I wasn't sure what I was going to work on,... In my "I want to partake" email, I listed projects such as working on an SD-card based storage drive for the KIM-Uno, my "Bare Metal C64" long term project.. which will likely wait until I retire, as well as working on the Interlock Homebrew Computer System. Then I started to get parts from an aliexpress order that I placed. I received my Arduino Pro Micro which is the teeny tiny version of the Arduino Leonardo. What makes this special is that the main chip on it is the ATmega 32u4. This is the USB interface chip used in the Arduino Uno. 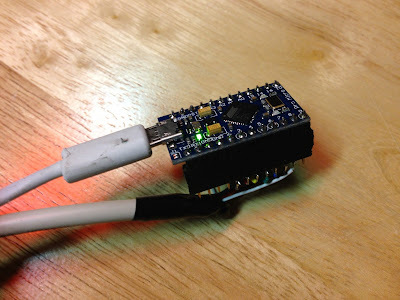 It has all of the standard IO of the 168/328, but with USB HID support. 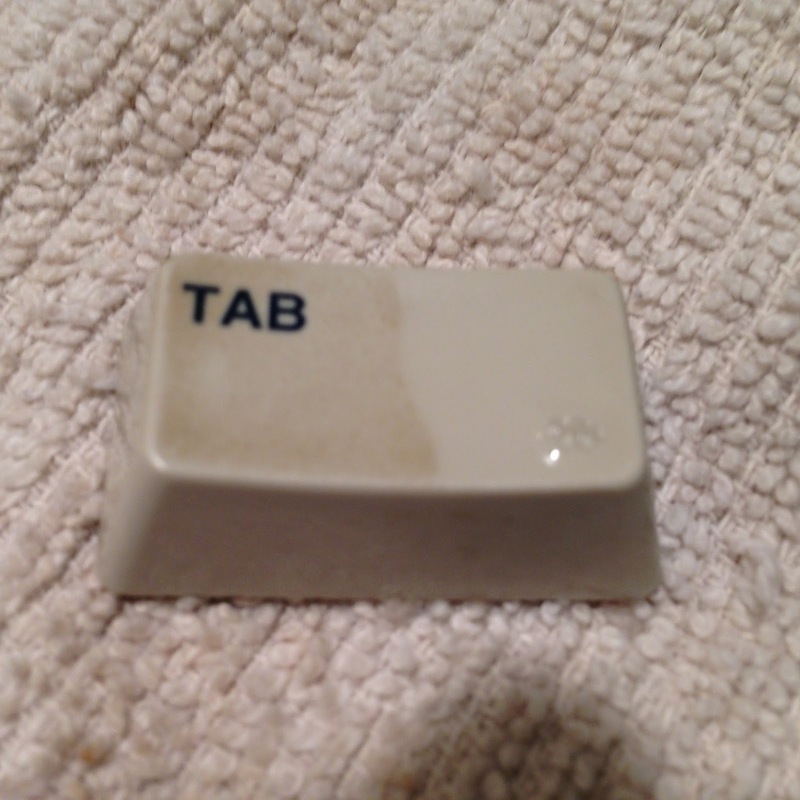 This means that it can pretend to be a USB keyboard, mouse, etc. This is a HUGE feature if you want to make standard computer peripherals. For some reason, it clicked that I wanted to make a USB HID interface for my Amiga mice. Long story short, within an hour, I had a functional prototype. 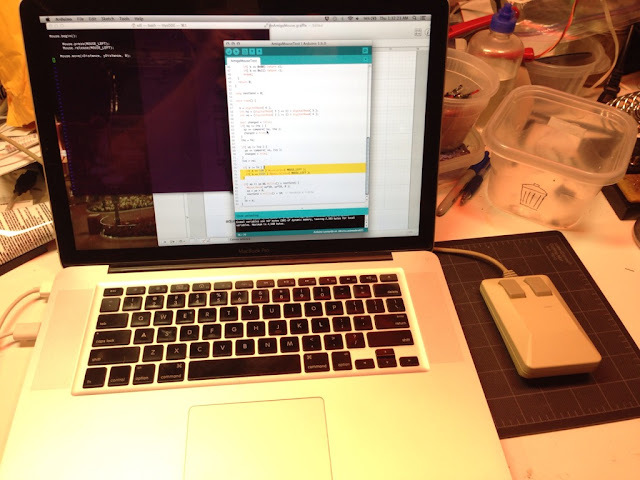 I was moving my Amiga mouse, and the cursor on my MacBook's screen was moving. I figure that this will be great for using the Amiga emulators. It'll be nice to use an authentic mouse, joystick and maybe keyboard with UAE, Vice or just for fun for regular usage. I know that there are other projects out there or products that do this kind of thing, but they're a bit pricey to have a widget that I can't expand or repurpose... and besides at its core, this is not really a difficult or expensive product. The most expensive single part so far is the microcontroller, and that was $3. The way old optical ball mice work is that they have two rollers that sit on a weighted ball, one for the horizontal, and one for the vertical. As the mouse moves horizontally, the horizontal roller moves, and the ball slips on the vertical one. The rollers have an encoding wheel with little windows that make and break optical connections with a pair of sensors. These two sensors generate two bits of data for each direction. (four total.) These two rotary encoders generate a gray code quadrature output. So, if you read these in a tight loop, and detect changes you can detect movements in the horizontal and vertical directions. In the same loop, if you look at the button inputs, you can determine if the buttons are pressed. This is the basis for this project. By reading these values from a dumb (no internal processing) Amiga mouse, I can generate vertical and horizontal motion values. I can then send these down the USB HID stack through the Arduino libraries, and voilà, we have an Amiga Mouse to HID USB mouse adapter. NOTE: PS2 and ADB mice have more smarts in them and output movement deltas rather than optical sensor pulses. Reading either of those requires serial communications and protocol decoding instead. 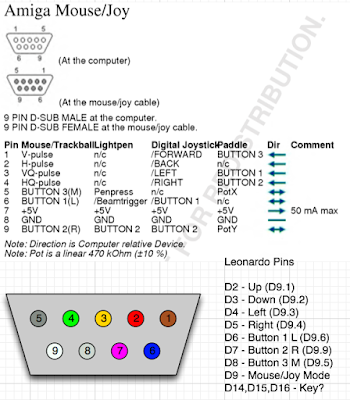 My cheat sheet for pinouts and connection information. Arduino Pro Micro (ATmega32u4), with headers and D9 cable attached. Commodore Amiga mouse plugged into a spare serial cable re-used as a D9 cable. Unfortunately, the serial cable I was using had all of the wires connected except for the line used for the right mouse button. Oh well... For the "what's available on my desk" approach, it was good enough for a proof of concept. The way I implemented acceleration was that each time through the loop, i check for Horizontal or Vertical ticks. I store the ticks as +1, 0, or -1 in an array of the last 128 readings. Then, I sum the entire 128 elements of each (horizontal and vertical) array, and use that as the mouse movement. The faster the mouse is being moved, the more +1s or -1s there will be, so it sends a larger number. It was a quick hack that I thought might work, that turned out to work perfectly! - Atari ST Mouse Support. 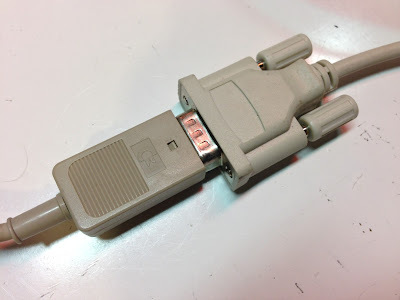 The only difference between an Atari and Amiga mouse are that two of the lines (specifically D9 pins 1 and 4) are swapped. This is an easy change in software. The difficult part is tracking down an Atari ST mouse to test with! And really, from that point, it would be near trivial to add in HID keyboard support as well... 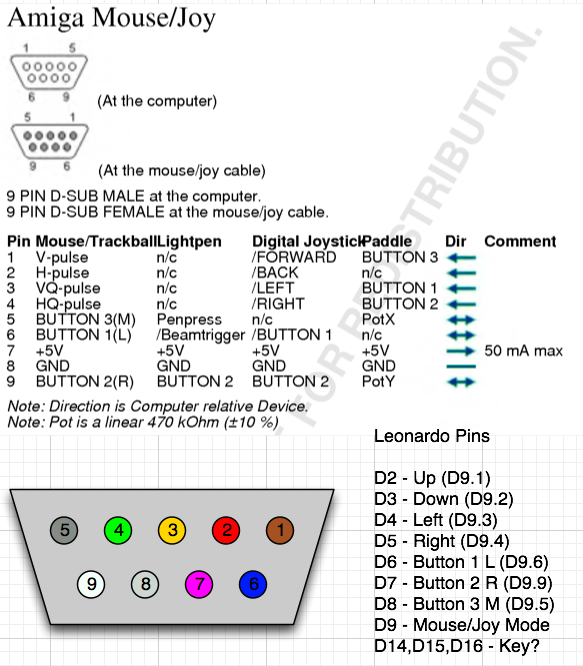 I can send down WASD key presses for joystick movements... or really any other key presses based on joystick movements. The right side has been cleaned using my proprietary cleaning technique described below. 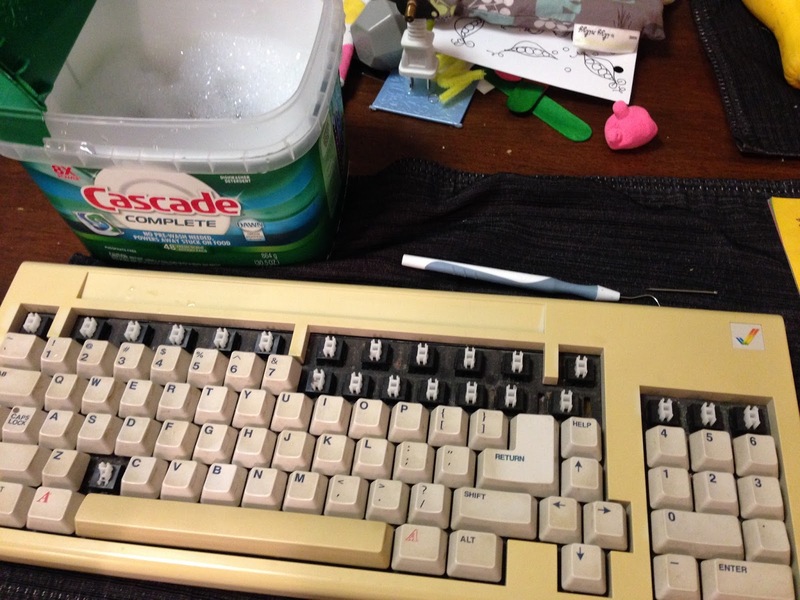 NOTE: Not shown is the process of removing all of the lint, hair and other bits of whatever that were stuck between the keys because that's kinda gross and you don't really want to see that anyway.. 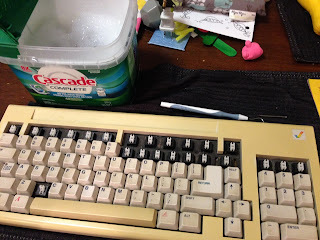 I briefly explored the idea of supporting Mac/Apple IIgs ADB mouse and keyboard support, but I quickly learned the complexity of the ADB spec, and am putting that safely outside of the scope of this project! The code for this project and other development details are available on github in the AmigaInputToUSB repository.